These luxuriant ornaments from Delta Creative are very easy to create. 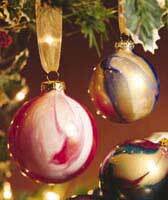 Enjoy the fun of making elegant swirls of paint inside of clear ornament balls. Remove hanger and cap from ornament. Pour alcohol into ornament, shake it around and pour it out (no need to rinse). Let dry completely. No moisture should be inside ball. Start with one color of Ceramcoat. Squeeze a small amount of the first color into the ornaments so it runs down the side (see photo A). Rotate ornament and squeeze a little more paint down the side. Add about three or four lines of paint with only a dime-size amount of paint pooling at the bottom of the ornament. Add the next color, squeezing out a small amount of paint in between the first color (see photo B). Add one or two more colors in the same fashion. Rotate and tilt the ornament a quarter turn every five to ten minutes until the paint covers the entire inside of the ornament. Drain excess paint into paper cup for 15 to 20 minutes. Turn upright and rotate every few hours over the next two days. Rest the ornament in an ornament box, egg crate or a paper cup. This helps the paint to coat the ornament evenly. The color will continue to move and change with each turn. When the desired effect has been achieved, turn the ornament upside down again and drain overnight. Leave the ornament open for two or more days to dry completely. Replace hanger and cap when dry. If desired, decorate with ribbon and hang on tree.